It is solid, lightweight, durable and it’s a worthy addition to your gun accessory collection. Tactical lights are more than just items that will help you search for things or individuals and ID targets. They are also a great way to improve your home or self-defense system. 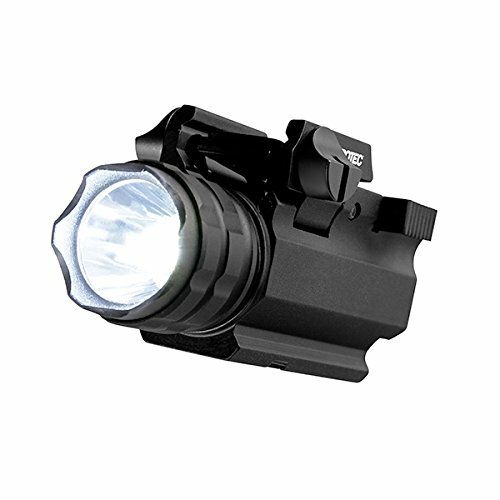 These days, you will discover that gun and gun accessory manufacturers from all over the world are now adding tactical lights on their product lineup too. The majority of weapon lights are versatile since they can be fastened on both handguns and long guns. In this review, we are going to discuss Nebo’s 6109 iProTec RM190 weapon light. It comes from a reputable brand that has been praised for their consistency in quality units. So let us determine whether this is something that is worth adding to your gun accessory collection. The Nebo 6109 iProTec RM190 includes an adjustable hinge attachment design that does not call for additional tools for mounting. One can adjust the light’s positioning on the weapon easily for a proper alignment required to lit target locations. It is recommended for rail-armed handguns and long guns. Apart from its mounting style, the way the device works also imparts a significant role since gun owners, of course, do not want to be involved with a challenging tactical light for emergency situations. This unit can be turned on or off easily by using its toggle switch, which is conveniently located at the side of the light. The unit has built from anodized aerospace grade aluminum material which guarantees that it is capable of resisting against corrosion and scratches. It is sufficiently tough to endure frequent usage and impacts which are something gun owners often deal with while firing guns. The Nebo 6109 iProTec RM190 is also water-resistant and this makes it great to use in extreme weather conditions like snow and heavy rains. The water-resistant properties and its superb strength guarantee the longer lifespan. The unit is pretty much a noteworthy tactical light according to gun owners. It was provided with decent feedback from its customers. One gun owner who tested the device said that it is great value for a home defense weapon light accessory. Granted he does not employ the light for field operations, he just appreciates that it can be fastened on his bedside table to check on suspect noises in the evening. Satisfied customers shared that the unit is a solid purchase, provided the owner fully comprehends its intentions and purposes. Even though the light has garnered pretty much great feedback, it has its own setbacks too. There were a bunch of customers who felt that the unit is not ideal for field applications. Each and every unit indeed presents its own capacities and when it comes to this unit, there were customers who have had high expectations for what it was not aimed for, which was the cause of their dissatisfaction. However, if we take a look at reviews depending on what the unit was built for, gun owners will discover that this device has a firm construction, design, and releases high-strength illumination. Some customers said that the light switch of the product definitely needs getting used to. But despite the number of bad feedback, we still think that this product is worth purchasing. If you want to acquire a device that can supplement your home defense system, Nebo’s 6109 iProTec RM190 firearm light is still a good recommendation. It is compact, lightweight, sturdy and it’s a worthy addition to your gun accessory collection. The output it generates when it comes to light is excellent. Even though it has garnered some bad feedback from several customers, just see to it that you understand how it works and where it works ideally. Therefore, it’s still a good buy.